Backup Assistant Plus was replaced by Verizon Cloud in 2013. Learn how you can upgrade to get secure online storage to back up contacts, photos, music, videos, messages and call logs. Learn how to uninstall an app or widget on your Droid Maxx by Motorola. Learn how to view different map layers, such as current traffic and transit lines, with Google Maps on your Droid Maxx by Motorola. 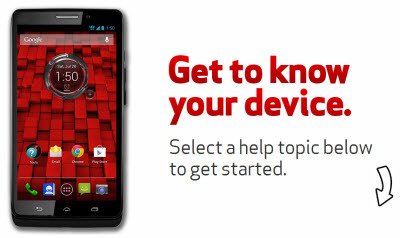 Learn how to find more help using Moto Care on your Droid Maxx by Motorola. Learn how to tweet on Twitter® using your Droid Maxx by Motorola. An interactive guide on how to upgrade your Verizon Cloud backup storage plan using your Droid Maxx by Motorola. A visual guide for exiting VZ Navigator on your Droid Maxx by Motorola.